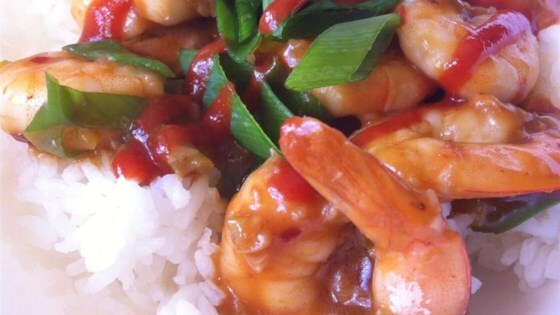 "Don't let some of the ingredients fool you--this spicy shrimp makes a simple, impressive dish, which I usually make for company. For more or less heat, adjust amount of red pepper. Serve over hot steamed rice." Good recipe, but really, ground ginger? Go all out and put some real ginger in, it makes the depth of flavor so much more interesting. i would recomend using raw shrimp as they cook so quickly. pre cooked shrimp come out rubbery while the raw ones will be nice and tender. try tossing in some bay scallops too.